So you did get a Humidor for Christmas! Well done on all the hints you dropped in the closing months of 2014, since you lost out for Father’s Day in June. But what have you done with it? After all the articles we have posted on preparing your humidor and ensuring the proper safekeeping of your cigars, you couldn’t have just opened it up and filled it with cigars, could you? You went through all the damping procedure, and watched the humidity fluctuate before settling at more-or-less 70% RH. That’s great!! Your cigars should be in excellent condition, a real joy to smoke. Keep them that way and they will age gracefully. Check what “The Winemaker” has to say. If you’re not sure what we’re talking about, click on some of the links. But you know, with all this about humidity in the humidor, there is another factor that we mustn’t forget. The temperature is as important – in summer maybe even more so! Hot moist conditions may lead to the formation of mould (US “mold”) – little grey spots on the cigar, and an unpleasant smell. This should not be confused with “bloom” or “plume” – a fine whitish dust on the surface of the cigar which is a good sign that the cigar is aging well. Can you tell the difference! This reminder might be of use to you with the hot (and often humid) conditions we are experiencing all over South Africa this summer. Oh dear - you didn’t receive a Humidor for Christmas, and Fathers’ Day / your Birthday are months away. Don’t despair at the thought of having to put up with the Tupperware “Humidor” you made as a temporary measure ages ago. Read about what to look for in a humidor, and make a choice. You probably deserve it just as much as your cigars do! PS These thoughts were first expressed in an article written in January 2011. Nothing much changes, does it! As usual, we visited Europe in January/February this year to see some of our major suppliers. Augsburg, Germany: A real treasure trove – we chose 20 larger size, quality Block Meerschaum pipes plus 2 Calabash pipes fitted with meerschaum bowls; a new smoky glass pipe ashtray and a good range of outdoor ashtrays; hipflasks in new designs; and we topped up on our popular Special Matches, which are running low. Savinelli: We selected individually some really high quality pipes – Autograph Handmade, shaped according to the grain; Jubilee D’Oro; Punto Oro Natural; and more. Lorenzo: An exceptionally successful rummage around the warehouse resulted in some one-off Grand Canadians, a range of Churchwardens in a variety of qualities and finishes, some Carvit pipes (at last). And nearly 2000 pipes to fill up our normal range of Filtro and Pavia. Marca: We ordered further supplies of Sport and Mignon, and discussed a new Marca “Snug” (6mm). We arrived back in our office on February 11 and to our surprise, and delight, we nearly fell over 5 cartons of leathergoods from our Indian suppliers; the goods had been ordered in Dortmund in September 2014 and promised for delivery in November 2014, but we knew this wouldn’t happen and had been waiting patiently. The company is one of the most respected manufacturers of high quality smokers’ (and other) leathergoods – the wait is always worth it. Now our order is here. Between the dollar value, and manufacturer price increases, the prices have increased – but the value is still there. One of the most popular leather pouches we offer is the Foldover Companion. 71-EX 795. Originally only in black leather, we have now added a deep brown model. And since we have been out of stock of this pouch for some time, we have singled out this item for our next “Pipesmoker” Special. What makes this pouch so good? In addition to the fine leather, it meets all the criteria, for its style, that we lay out for all tobaccos pouches. nylon zips which slide open/closed sweetly. Needless to say the soft, pliable, leather is a pleasure to feel, and the precision of the stitching is a trademark of an expert machinist. 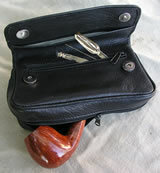 It is without a doubt our favourite leather pipe tobacco pouch. One which we would like you, as a valued customer on our database, to have the option to take possession of - at a rewarding price. In fact very good news. Two new cigars under the Vegueros brand have arrived, and what great cigars they are. Because of the price and past history the Vegueros brand was thought to be a “budget” line brand to attract new smokers to the world of Cuban cigars. Here is a summary of research I have done on this brand. 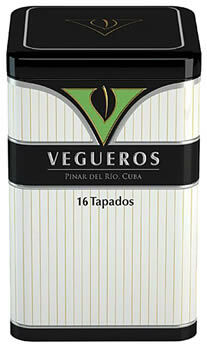 Vegueros is a “post revolution” brand, founded in 1997, and produced in the province of Pinar del Rio, the home of the famous Vuelta Abajo valley. The name Vegueros translates into the word “farmer” and is a tribute to the generations of farmers who have cultivated tobacco in the province. The factory is housed in a building first erected in 1868, which served originally as an Hospital, then as a Prison, as a School of the Arts, and more recently as a cigarette tobacco factory – before making cigars. - thicker, shorter Vitolas (models/shapes), and incorporating a new band. The modern Vegueros cigars are fully hand made with tobacco from the Vuelta Abajo Valley, and the strength has been reduced from full to medium, which is in line with the shorter, thicker shapes. This was received late in 2014. The response to this cigar was amazing, and it sold out in a few weeks. Packed in rectangular tins of 16. Well priced at under R130.00 singly, these two cigars are not to be missed. But you will have to move fast as I doubt that, as with the Petit Edmundos, the stock will last more than a few weeks. Need to arrange collection from us? Just ask. Now here is something else to think about. I sold two single Vegueros cigars to a young man, who then confessed that he didn’t have a cigar cutter, which could I suggest? A simple question, yes - but hold on: one has a relatively flat 46 ring head, the other a tapered point. So let’s put the question in another way: what sort of instrument won’t suit? On to the cigar scissors. I demonstrated the trick of rotating the cigar as you apply the pressure of the scissors to the head above the cap line. This showed how the cap just “popped off”. He opted for the scissors. How about if we offered a discount on any of our cigar scissors? You can buy Cigar Scissors at 25% off the normal retail price! The Lorenzo Pipes, selected on our February visit to Gallarate (Italy), have arrived. This always creates a flurry of action in the office, our storeroom and for the webmaster. While the costing is being done, the boxes of pipes are unpacked and sorted into their various groups and subgroups. Janua 9mm – a new model (once off). Bent Rhodesian in rustic finish with a polished top; 9mm option. Monica 6mm – original Lorenzo shape (T111) from his “Bent Galore” range. The widest range of the very popular Churchwarden shape pipes we have ever had. Just looking in amazement at all the different pipes on the sorting table, makes me aware of how fortunate we are to represent Lorenzo Pipes in South Africa. Our more than forty-five years association with Lorenzo pipes goes way back to when all the pipes were made in Gallarate, outside Milan. It has continued through the split division of production between Italy and Albania, up to the situation of today where the quality of production in Albania has improved so much that all the pipe production is carried out in that country. The Gallarate office is used for control, storage, shipping and accounts. This improvement in expertise, coupled with the lower manufacturing costs in Albania, results in the production of some of the best “Value” pipes in the world; and in the branded Lorenzo pipes being very competitive in their market. The non-filter small pipes from R215.00. The Teflon pegged Filtro or Pavia pipes between R265.00 and R595.00. The Churchwarden pipes from R495.00 to R695.00. Fine quality Churchwarden pipes - Lorenzo Lectura, Lipari finish, 3 stunning shapes at R990.00. (54-LorLetLp) – 3 models in the golden “Lipari” finish. This will be your opportunity to experience the stylish, cool pleasure of a classic Churchwarden, in really good quality Briar at a pocket-pleasuring price. But stocks are limited so look, choose, and buy. Questions have arisen from the last “Across the Counter” cigar article. What is a “safe” cut? The head of a handmade cigar is sealed with a cap, usually cut from the same wrapper leaf being used so that the texture and colours match. This cap holds the wrapper in place. The edge of the cap creates the cap line. It is not safe to cut beyond this cap line; the wrapper will probably unravel (untidy and often irritating), and may lead to the disintegration of the head of the cigar. The “Safe-cut” cutter has a solid back behind the blades. This is to prevent the cigar being cut too deep, possibly beyond the cap line. The head of the cigar cannot go any deeper between the blades than is “safe” – for most cigars. This ensures that an “accident” cannot happen. A firm snap of the blades produces a clean “safe” cut off the head of the cigar just a few millimetres deep. Yes, but you said that it wasn’t suitable for the customer last time. Who would use this type of cutter? It is especially useful for newcomers to the world of cigar smoking – and to those cigar smokers who find that they constantly misjudge the placement of the cut, and need a safety net. I didn’t recommend this type of cutter for the tapered head of a piramide, but if necessary, several slices would do the job safely. In respect of the availability of Vegueros cigars. Did you take the opportunity to try the Tapadas or Mananitas? As we predicted about the re-launched Vegueros cigars (featured in the last article), the Tapados is completely sold out, and only a last few of the Mananitas remain. The good news is that all three of the Vegueros vitolas are on order – no confirmed delivery date yet. Entretiempos 110mm x Ring 52 - Petit Edmundo (or very thick Half Corona); Rectangular tins of 16. Tapados 120mm x Ring 46 - Moreva Gruesa (short corona extra); Rectangular tins of 16. I don’t yet know any prices, probably increases due to the last budget and the dollar rate. But from our experience they will be a good buy. Back to the “safe-cut” cutter. The idea has obviously become more acceptable because we have found two models to offer. You can buy “Safe-cut” cigar cutters at 25% off the normal retail price!